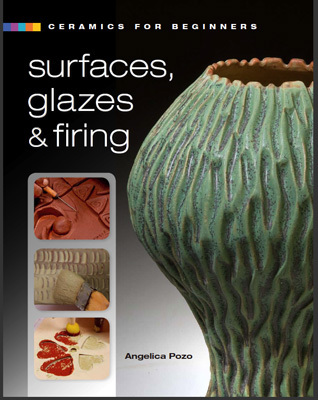 Angelica Pozo - "Ceramics For Beginners: Surfaces Glazes & Firings"
...this book is about decorating the surface of clay: using color and texture, line and shape, pattern and image to transform a attractive form into an object of brilliant beauty. We’ll begin with an overview. Since clay can be decorated at every stage of the ceramic processfrom wet ware and leather-hard, to greenware and bisque, to glaze firing and beyondI’ll review the ceramic process briefly, and describe the decorating techniques you can use at every stage. Next, I’ll provide a bit of theory and lots of practical suggestions for translating your visual ideas into actual designs, and for developing those ideas in the first place. Getting Familiar with the Decorating Studio introduces the tools and materials that make decorating clay so much fun. (This is when you get to shop.) You’ll also learn some basic skills, such as brushwork and transferring a design onto clay, as well as important safety tips. Then comes the heart of the book: the techniques for decorating clay. Organized in the same order as the ceramic process, these techniques will soon have you carving and stamping; combing and drawing; staining and stenciling; glazing and overglazing; and much, much more. Finally, you’ll find a discussion of the all-important topic of kilns and firing.